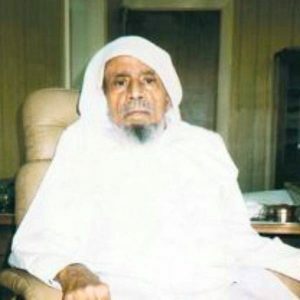 Abdullah Al-Khayat was an outstanding reciter of the Qur’an. His recitations were during years opening Saudi official TV channels and radio stations. Sheikh Al-Khayat was widely appreciated thanks to his beautiful voice and bewitching recitations. Leader of the reciters of that time, Abdullah was also a distinguished theologian and a man of letters and a member of the Master Theologians Instance. He has memorized the Quran at a early age and took his first religious lessons from eminent Sheikhs of that time like Sheikh Abdullah Ibn Hassan Al El-Sheikh and Sheikh Mohammad Abdur-Raziq Hamzah. Al-Khayat was a graduate of the Saudi Scientific Institute of 1360 Hijri. He was nominated imam and preacher of the Grand Mosque in Jeddah by a royal decree. He was exempted from his functions regarding to the deterioration of his health condition. Sheikh Al-Khayat has published many pieces of work on different religious matters which contributed to the intellectual Islamic movement. He died in Sha`ban of the Hijri year 1415.